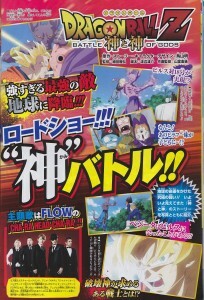 The March edition of V Jump Magazine has been leaked from Japan and it gives us a few new previously unseen screen shots of the new Battle of Gods movie along with a few new spoilers. The spoilers come in the form os Bils / Birusu beating up Buu and Gohan with no problem much like the picture we saw last week of him blocking Super Saiyan 3 Goku with ease. It also mentions that Vegeta may hav e known of ar even met Bils before the movie when he was still a soilder in Freizas army.